I’ve been severely lacking with my updates lately. This whole working for a living gets in the way of the fun things. Back in April I visited my parents in Florida, armed with a new 300mm lens I couldn’t wait to try it out. Fortunately I planned some plane geekery at the Fun N Sun and spotting at TPA. Unfortunately 8 months later, I’m just getting this posted. as Drew Field, it was renamed Tampa International Airport in 1950. From 1950 to the present, there have been several expansion and modernization projects to make TPA one of the greatest airports you will ever set foot in. Including the current project that has just gotten underway. 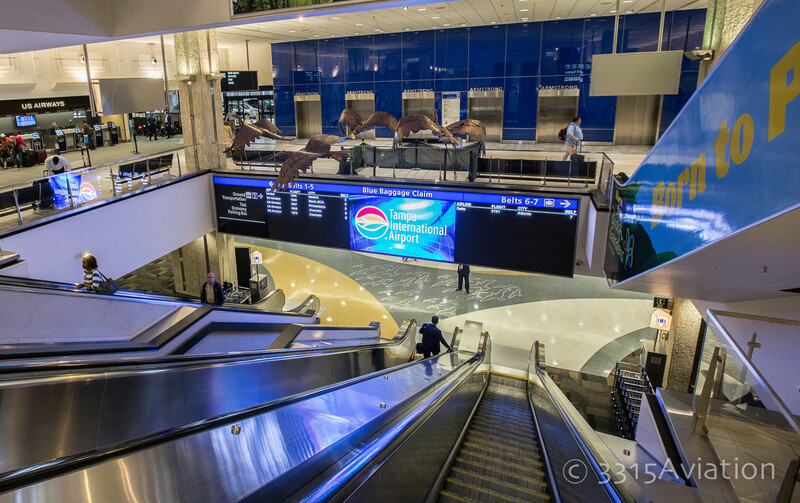 Tampa International is constantly finding itself at or near the top of “Best of” lists. If you’ve been there, it is very evident why. As you approach Tampa from the north you are greeted with gorgeous views of the Gulf of Mexico and the white sandy beaches of Clearwater and St Petersburg Beach. The great feature of Tampa are the 2 parallel runways with the terminals between them which greatly reduces taxiing times. Grounds crews are very quick to get planes to their gate and the skybridge in position. Despite what can only be described as similar to a free for all trying to scrounge for the last Van Damme straight to DVD release in the $5 bin at WalMart, once people get their carry on trunks out of the overhead compartments and you can finally deplane. Quite possibly one of the top 3 greatest smells known to humanity(other than that of Fenway Park and Alfond Arena) is that fresh Florida air that hits you as you make your way to the jet bridge and into the terminal. The brief shot of humidity is soon forgotten as you enter the air conditioned terminal. The terminals, or Airsides as they are referred to at Tampa are the best I’ve ever been into. Tall ceilings with floor to ceiling glass provide unmatched natural light from the Florida sunshine. As you make your way from the gate area the iconic trams that shuttle passengers from the main terminal to the Airsides make continuous runs keeping you moving with minimal wait times. walk ways are very wide and uncluttered, even at peak times with arriving and departing flights. You’re not going to be bumping into your fellow travelers because of congested walk ways. When you make it to the main terminal, it is an easy shot down the escalators to baggage claim. As iconic as the trams are, for me the bird sculptures going down the escalators are a true welcome sign to the Tampa area. Regardless of the airline, ground crews are very prompt at getting baggage from the aircraft to the belts for you to pick up. Baggage claim is neat, orderly and efficient. In all of the times I’ve made the trip to Tampa, I never had to wait more than 10 minutes for my bags. Belts are marked with LED boards indicating airline, flight and city arriving from. Ground transportation is so easy, someone who grew up in a rural Maine town with 1 street light can do it. No really. Curbside pickup is fast and efficient with 2 stop lanes for family, friends or cabs to stop and pick you up. If you are picking up a rental car, simply cross into the rental area of the terminal and find the counter for your rental company. From there it is a short walk to the garage area to get your vehicle. As easy as this is, it is going to be getting A LOT easier in the future. When departing through TPA your arrival from I-275 or whatever highway you are coming in on can be a bottle neck due to various infrastructure improvements in the downtown Tampa area. As you exit the highway and make your way to the main terminal, airlines are broken up into 2 colors. Red and Blue. Depending on your airline, and if you are departing or picking someone up, signs will list airlines and then follow them to the respective terminal area. Skycaps line the curbside for easy checkin thus reducing the pain that can occur waiting in line to see an agent. Within minutes of either dropping off your rental car or getting dropped off curbside, you are checked in and on your way to the main terminal. The main terminal at TPA is a thing of beauty. 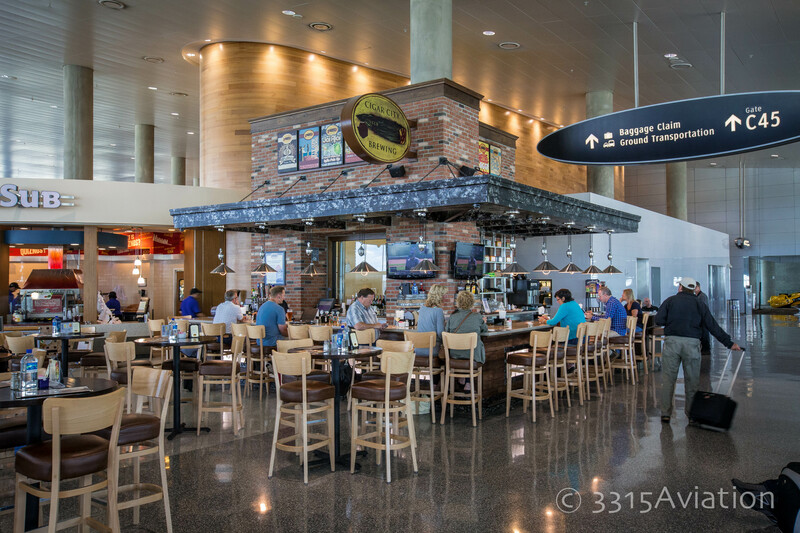 With new options being added to current concessions such as Starbucks, a wine bar, numerous food and shopping choices, the management at TPA have done a phenomenal job of making you think you’re not actually in an airport. Just as you arrived, departure is almost the same. With the exception of security screening. TSA checkpoints are located in each Airside keeping congestion out of the main terminal. You must present ID and boarding pass prior to boarding the tram. Security screening can be an issue at peak times, as it is at large airports. Although it seems to flow quiet well regardless of the traffic patterns. Upon clearing security, you will find many concession options depending on your terminal. Tampa offers a local flair as well as your typical airport fast food eateries. Not to fear, there are Starbucks everywhere. Gate areas are great, and I mean great. With the high ceilings and natural light flowing in from the Florida sun, you don’t get the feeling you’re in a tunnel. There are plenty of seats with power charging stations for you to juice up the iPad or iPhone for the flight. At no time will you feel cramped while waiting for the boarding process. In other airports, such as LaGuardia, it almost feels as though you’re trying to see how many clowns can fit in the trunk of a Miata. The boarding process, which varies by airline I’m sure, is relatively easy. Once on the plane, and everyone has crammed their Miata with a trunk full of clowns into the overhead compartment, it isn’t long before you’re airborne. As with arrival, short taxi times from gate to piano keys coupled with minimum congestion, mean quick wheels up times. While I’ve been delayed there in the past, it was due to issues at connecting airports. Each year I visit the Tampa area for vacation and try to get to the parking garage a few times to do some spotting. 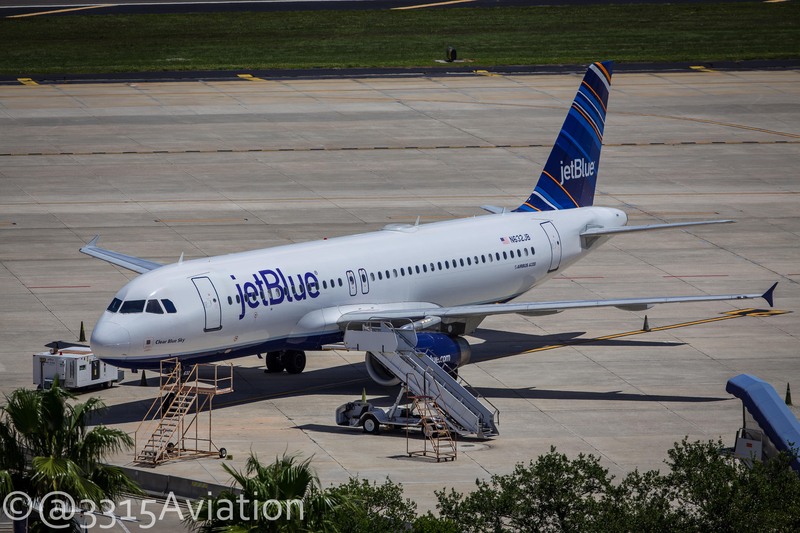 TPA is very much plane spotter friendly, in fact they encourage you to come out and enjoy the 360 degree views from the top floor of the parking garage. Still, I contacted the airport through their Facebook page to see if there was anyone I needed to contact to let them know I would be there a few times taking pictures. Given the world we live in, a pasty white, bald, bearded guy from Maine with a 300mm lens is going to stick out like a sore thumb, plus I didn’t want to spend my 2 weeks away from snow, in the crowbar motel. I was very surprised with the quick response from their communications director, Emily. She was very welcoming and pointed me in the direction of some of the popular spotting locations on the airport campus. What I didn’t expect was when I arrived she met me on the garage and offered to give me a tour of the airport. We talked some of the major renovation and expansion that is now underway. As stated before, when you arrive and go to baggage claim, if you need a rental car, you simply walk across the street from the terminal and into the rental counters. When it is all said and done, the rental car center will be moved from the central garage which will add more parking spaces for the public and will then be connected with a 1.4 mile tram. Just like the ones that bring you too and from the Airsides. Other improvements include a 50,000 square foot expansion to the main terminal what will include a patio to sit and eat or, watch planes as well as the demolition of the Marriott Tampa Airport Hotel. In the main terminal as well as each airside, concessions will be revamped and help bring a local flair to the menu. Brewing Company(paying homage to Tampa’s cigar making history) offers some exceptional microbrews (Jai Alai IPA is my favorite). Also located in Airside C is Schula’s Bar and Grill as well as Schula Burger. Moving over to Airside E is the Columbia Grill which has some local flavors as well as an exceptional selection of microbrews. very strict with spotters and cause for many run ins with the police, Homeland Security and other legal entities. Tampa International is NOT one of them. Their short term parking garage provides exceptional views of both runways as well as aircraft taxiing and sitting at the gates. While there isn’t a lot of heavy traffic there are a lot of rare liveried aircraft from Southwest, US Airways and others. Heavy traffic includes a 777 from British Airways, A330s from Edelweiss and starting next year, Lufthansa will be flying their retooled Airbus A340s to and from Tampa. As with anywhere, charter flights and diversion include 747s and the Japan Airlines Dreamliner. Typically I would go into Tampa by WestShore Mall and get a burrito at Chipotle and then head for the garage. However, with all of the excellent options in the terminal, you can head over and spot, hop on the elevator and go down to the terminal, grab lunch and then come back and resume your regularly schedule plane geekery. Obviously, this is Florida, don’t forget your sunscreen and a hat. If you’re on the top floor there isn’t any shelter from the sunlight. However, one floor down, you’ll be in the shade and still have great views. A bottle of water doesn’t hurt either. When I was there I had a full frame Canon 6D and my 300mm lens. You can get shots with something in 70-200 range with a crop body but full frame will be tough with that focal length. Don’t forget the FlightAware and FlightRadar apps on your phone. I wish I were closer to the airport to follow the progress on the master plan more closely but April is coming soon enough and I’ll be interested to see the changes that have taken place. The future is bright in Tampa and the airport is the best airport I’ve ever set foot in. With disappearing seat pitch and rising ticket prices, the team at Tampa International are the bright spot in air travel today. Well, them and Biscoff Cookies from Delta. Until next time, WHEELS UP!